A University of Toledo cancer researcher has received nearly $450,000 in grant funding from Susan G. Komen Northwest Ohio to continue his research into triple negative breast cancer, an aggressive form of the disease that frequently develops resistance to existing chemotherapies. 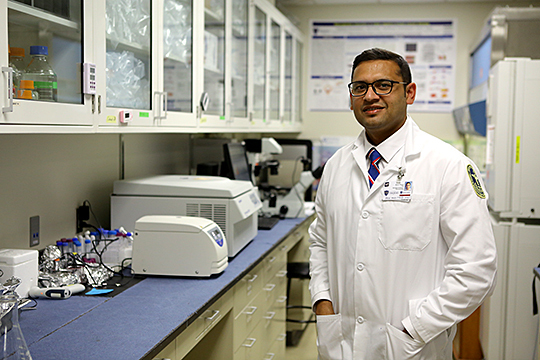 Dr. Amit K. Tiwari, an assistant professor in UT’s College of Pharmacy and Pharmaceutical Sciences who specializes in investigating multidrug resistant cancers, recently identified a new chemotherapy drug that is showing promise in curing triple negative breast cancer, even in cases where patients have developed resistance to conventional chemotherapy. Triple negative breast cancer accounts for between 15 percent to 20 percent of all breast cancer cases. Treatment is difficult because the cancer does not respond to hormonal therapies or therapies that target HER2 receptors — common methods of treating other breast cancers. But what makes the disease especially deadly is that the patient often develops resistance to currently available chemotherapy drugs. “The goal of my research has been to understand why these patients end up getting drug resistance and how we can stop it,” Tiwari said. His research led him to targeting the cancer cells in a nonconventional way, which has proven both successful in treating the disease and in reversing drug resistance. The new treatment, which has been lab-tested on human breast cancer models, has been provisionally patented by UT. With the three-year grant from Susan G. Komen Northwest Ohio, Tiwari and his team of researchers at The University of Toledo will be able to continue development and research of the new drugs and move their work closer to clinical trials. Triple negative breast cancer patients currently have a poor five-year survival prognosis; however, Tiwari said those who do make it to the five-year mark have a good long-term prognosis. If the new treatment is proven to be as promising as the initial research suggests, Tiwari said it could be a major breakthrough toward curing triple negative breast cancer. “This actually brings a lot of hope,” Tiwari said. This entry was posted on Wednesday, September 26th, 2018 at 4:00 am and is filed under News, Pharmacy and Pharmaceutical Sciences, Research, UToday .